Every once in a while I design a set which ends up having a real connection to me and who I am as a person. Our new set, Boards & Beams happens to be once of those sets. Home is extremely important to me, and has been my entire life. I remember every detail & feeling associated with every home I’ve ever had. Little pieces that I carry within me wherever I go. This set features two homes, one to represent rural country living and one to signify the city life. Tonight I have used the country home image, inspired by my own home. (I will share a project using the city home later on this week!) This set includes several sentiments that are perfect compliment to the images! 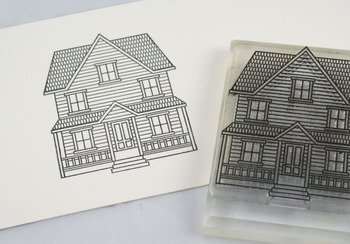 There are also a few home "accessories" that allow you to personalize your home! Today I am going to share with you a few tips to keep in mind when using these accessories! This is the first part of a picket fence. Notice that it has two fence posts with the individual pickets filling in between. To begin building your fence, it is easiest to draw a pencil line across your cardstock where you want the bottom of the fence to fall. This makes it easier to line the sections up. This is the second section, featuring only the pickets, no posts. It is VERY easy to just line it up with the pickets from the first section and build onto your fence! Here I have repeated the first section with posts. The combination of the two images makes for a seamless fence. And because of the way they are broken down, you can make fences as long or as short as you like! Recognize this tree? 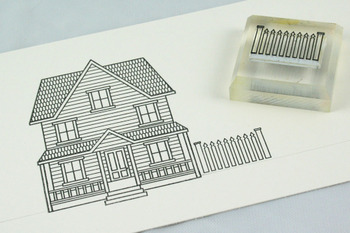 It is taken from our popular Father Knows Best set, but reduced to half the size, making it the perfect scale to compliment the houses in this set! You can use the trees along on either side of house to "landscape" or you can add them behind the fence. It is effortless to mask the fence for the tree. Just stick a post it note onto the fence, lining up the top along the bottom edge of the pointed pickets. 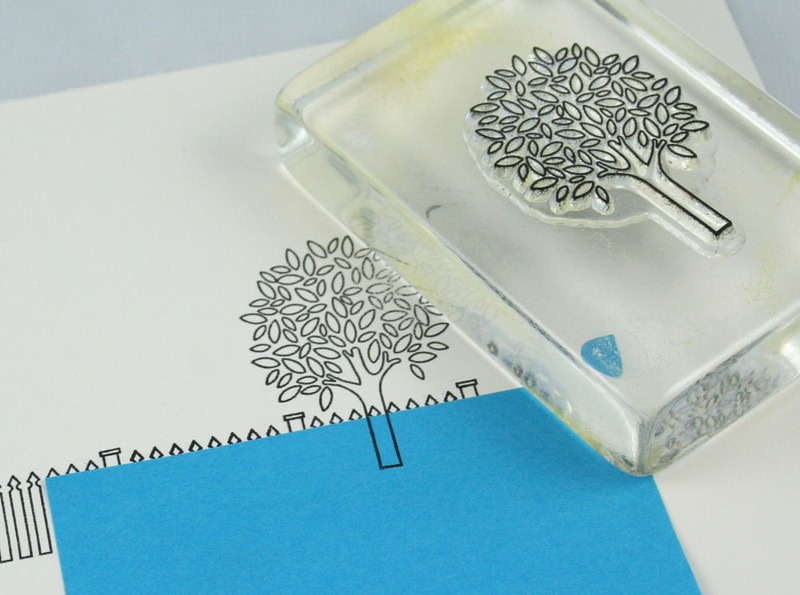 Stamp your tree and you are good to go! Here is my completed scene. Notice how I varied the "height" of the trees easily, since I was masking and the bottoms were being omitted. I decided to use Copic markers to color my image. I started with the roof & tree trunks using E27 (Africano) and doing a little shading with T5 (Toner Gray No. 5). Next up was the greens. 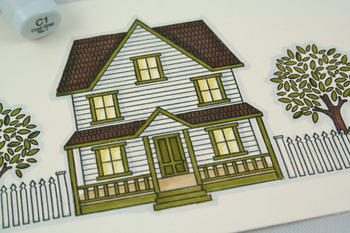 I used YG95 (Pale Olive) for the trim of the house & tree leaves. I went back in with G99 (Olive) to add a little contrast to a few leaves in the trees. I wanted a warm glow for the windows, so I used Y21 (Buttercup Yellow) to create some shading and than colored over that with Y000 (Pale Lemon). I used E31 (Brick Beige) to color the floor of the front porch. I found C1 (Cool Gray No. 1) to be the perfect shade of gray when adding just a tad of shadow along the bottom edge of each piece of siding to emphasize the "white" siding I wanted to create. I also added a heavy application under the eaves and the right side of the window casings. 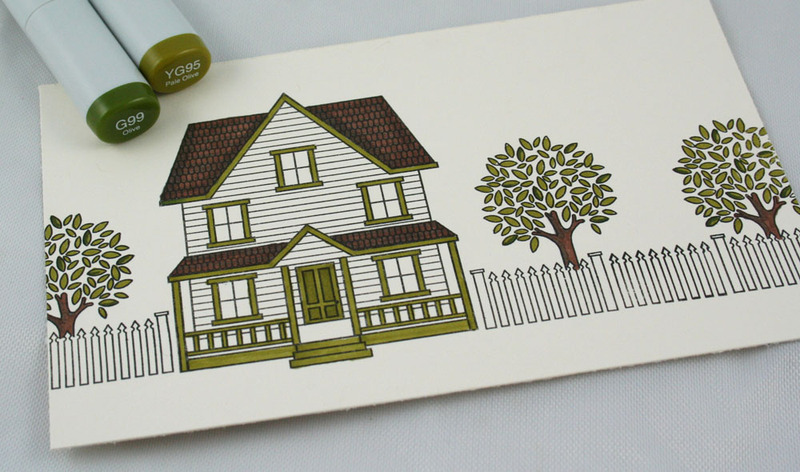 I also used it to outline the trees and fence posts to help create some definition. My completed image created the perfect backdrop for one of my favorite sentiments in this set, "Thank you for making us feel right at home". This is one of ELEVEN sentiments included in this versatile set! I distressed the edges of the Vintage Cream cardstock a bit with Frayed Burlap Distress ink & followed up with a little roughing up with my fingernail. I stitched it onto an olive green mat and adhered everything in place on a Vintage Cream card base. I used the slot punch from Making Memories to create a space for a bit of Lemon Tart Twill Tape. I thought this helped to bring out the warmness I had accomplished with the windows of the house. I dabbed a bit of the distress ink onto the ribbon too to make it look a bit more vintage. I hope you enjoyed today’s peek! Tomorrow I will be introducing our latest innovations in building backgrounds! You won’t want to miss it!!! 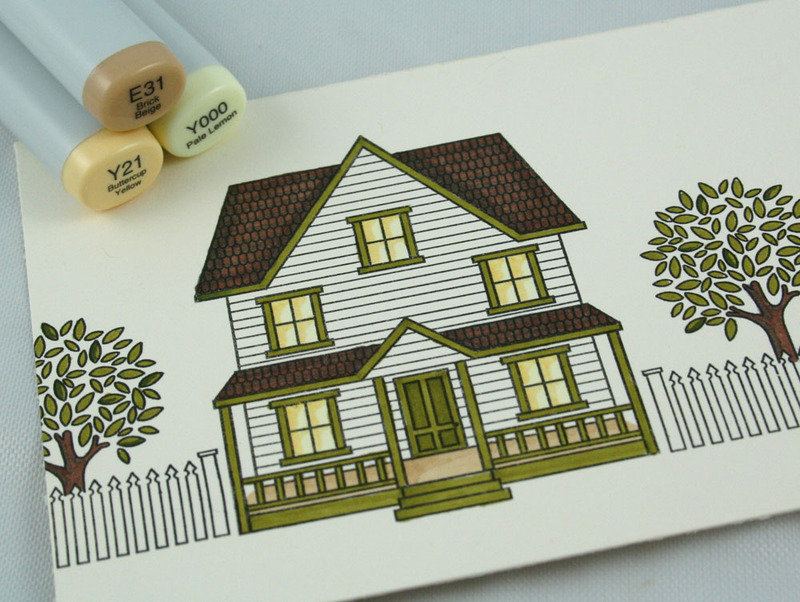 Visit Lisa Johnson’s blog to see what she has been up to and congratulate her on her first stamp set! Taylor used the same image from Boards & Beams to make some adorable gift wrap! Very nice! I can’t wait to see more of this set but I quite like how soothing it appears to be. Oh my, I am in awe with this set. You have really outdone yourself and I can’t wait to see the rest of it! WOW! I LOVE this set! I can’t wait to see the rest of it. “Home” is very important to me, as well, so this set will get a great deal of use. I’m having this set!! 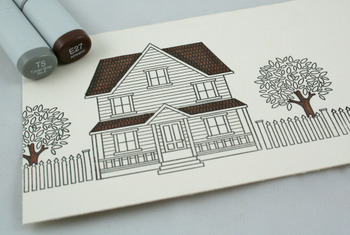 (along with many others) I have a real thing about little houses and i’m in love with the whole board look. It is gorgeous. Gee, I thought I recognised those trees! *wink* LOL First I thought you used shrinkies to make them small but then I continued reading your post….with our upcoming move, this would be the perfect set. Ahhh! I was RIGHT at my guess for once! 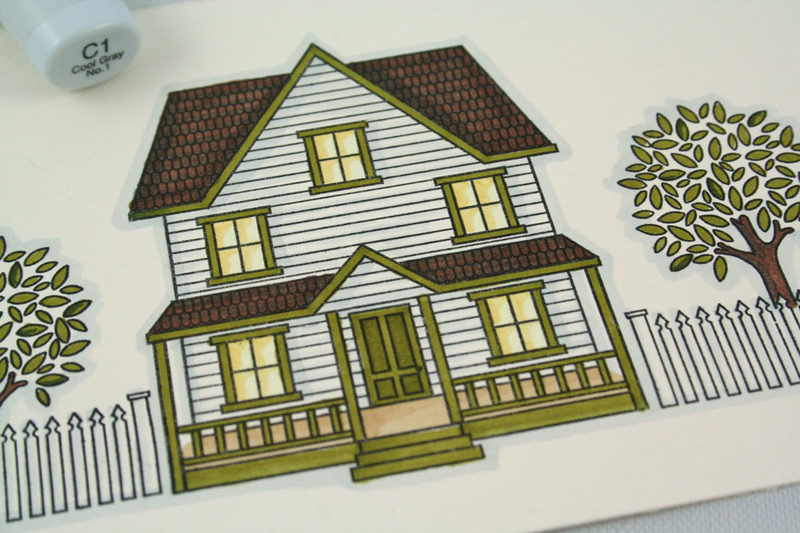 I knew from the sneak peek that it was inspired by your house! I’m good! And the set is beautiful…can’t wait to get it. Nichole, outstanding, as usual. You never cease to amaze me! Love it….I am quite surprised that you have designed another outline stamp set two months in a row…..I normally dont do outlines….cause I hate colouring (truth be told…it takes too long! )but it looks like I will be ordering this set! Beautiful card Nicole. YAY! yay! YAY! I am going to LUV this!! 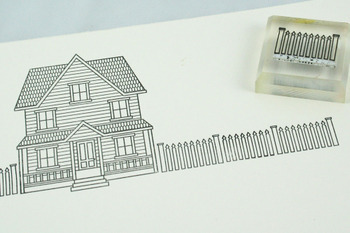 I can’t wait to buy this stamp set. I love the house & the picket fence. Too cute Nicole. LOVE IT! And the new color plus the cream CS! YAY! Oh, I’m so excited! That’s MY house. 🙂 It’s one hundred years-old this year, and we are going to have an open house to celebrate. This set will be perfect for the invitations. Yay! Wow, can’t believe that I called this one at the first sneek peak. I can’t wait to get mine and play!! I’m in LOVE with this set! I can’t wait to see the other house! WooHoo! I love how you always have such a classic look to the sets you design, Nichole! Thanks for this one! Love this card! You have totally reflected your love of home in this set. Such a warm and welcoming feeling. 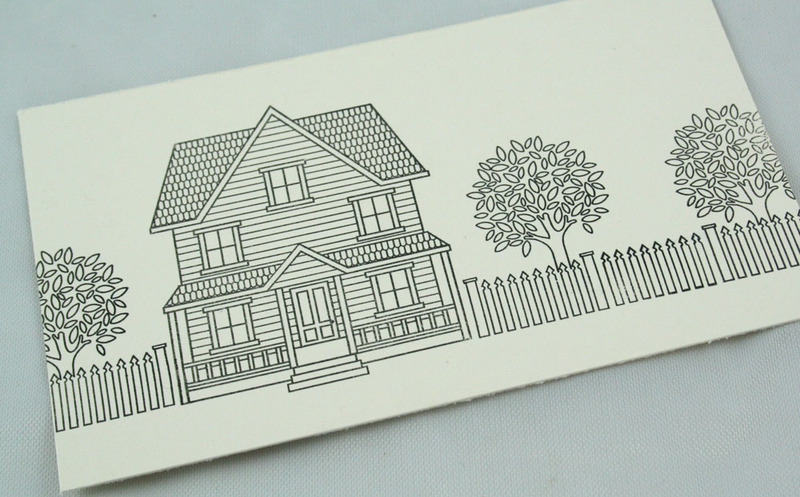 Love all of the details for the fence and trees. This is the first peek…wow! You are totally amazing! OMG, I LOVE this set! I really think this could end up being my favorite PTI set ever! Oh my goodness!! This set is sooooo cool!! Every single month you amaze me with your creativity!! And your other designers are amazing as well!! Can’t wait to see the rest!! this card is gorgeous!! I can’t wait to see the city house!! Seriously, you have really outdone yourself this time! I cannot WAIT to see the rest of this set. And I was just thinking the day before yesterday that you needed to come out with a vanilla cardstock! Can’t wait to place my order! This will be an amazing stamp set; can’t wait to see the rest of it. I was hoping you would come out with a “cream” cardstock. This is all very exciting! Wow! I am SO EXCITED about this set! I can’t wait until the 15th (actually, I can’t wait until my order arrives!). 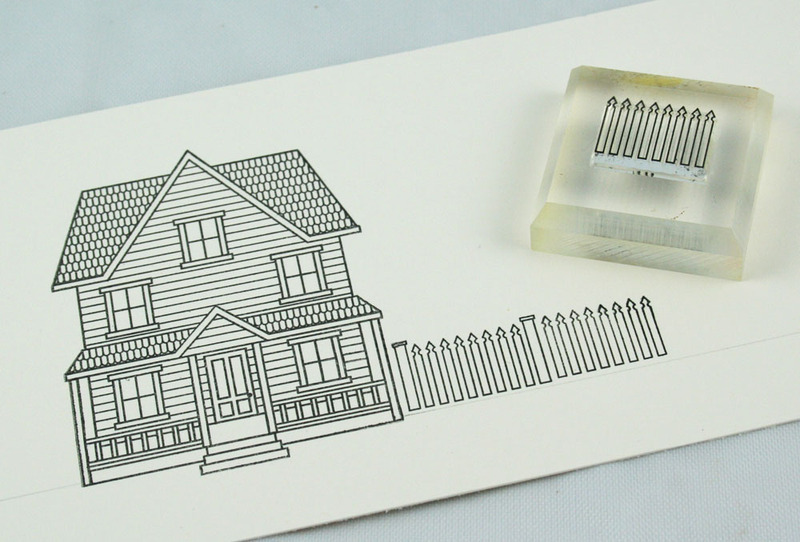 Your stamps and papers and everything just get better and better every month!!! I can just see myself adding details for each season and occasion when I use this set. I can add blossoms or fruit to the trees, decorate the yard with pumpkins or build a snowman in the yard! What fun! Beautiful set. Can’t wait to see what else is included. I HAVE TO HAVE THIS SET! I love what I’ve seen so far. It’s so cruel to tease. When’s the release? I love this tree. When I saw it in the Father Knows Best set I knew I loved it. Since then I have found out why. One of the books I read to my older kids is back in circulation in my home with child number 3. Sleep Tight, Little Bear is a wonderful story and the tree reminds me of the ones in this book. Waiting for this realease could very well drive me over the deep end! This set looks like a must-have! Very cute! I love sets you can “build” with! I can absolutely relate to being connected with each and every house you’ve ever lived in. This is a wonderful set. I look forward to seeing the sentiments. FABULOUS set—love your card too!!! Nichole, once again you blow me away with how perfect each and every Papertrey set is! The house is gorgeous, the fence is designed flawlessly and I LOVE the tree! OMG! Awesome house! DH designs and builds houses so I am always on a look-out for building images… LOVE this one! TFS! This is absolutely one of my favorite things you have ever come out with. I love it, love it, love it!!! Great set, I love that sentiment. OMG – I’m in love with this new set!!! It is gorgeous!!! It’s one my list for sure!!! 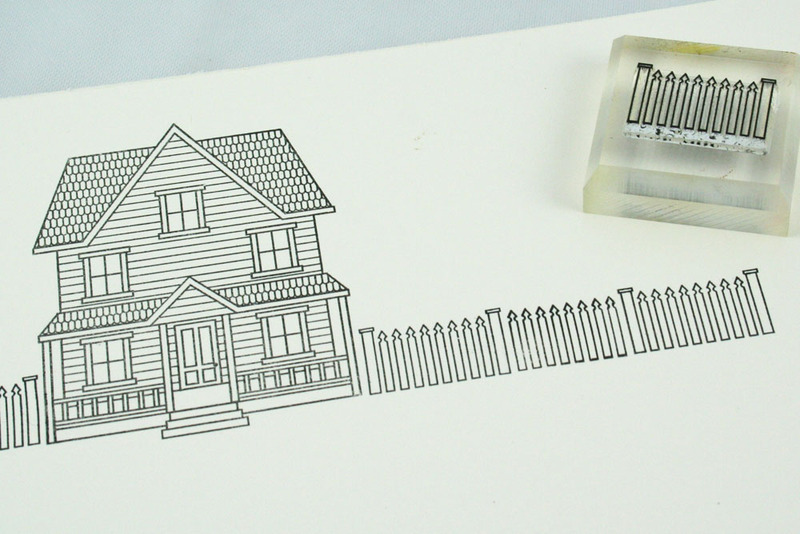 I’m already the proud owner of the tree stamp and I can’t wait to get the house – YEAHH!!! BTW – your card is just FANTASTIC!!! Amazing set!! How unique!! Great idea! I think I’m going to like this set a lot. This set is so versatile and useable. I just love it. The house is great…love the roof. Great set. This is awesome; I love it and love the way the house just opened up as you addded each color for the trim etc. A really cool set. You are very talented too.